Last year, our family went on a Mission trip to Mexico that changed the way we see the world. Some of you helped us with that, and we are so grateful to you. We built two homes for people who had nearly nothing. We met people who lived day to day in some of the poorest conditions we have ever seen, washing their dishes in the front yard and trying to raise their children and make a life in an abandoned motor home. We hope that, by giving them a permanent home, we made their lives a little easier. And they blessed our lives in return, giving us a much-needed different perspective. The highlight of our trip was throwing a birthday party for a severely handicapped boy who would live in one of the homes we built. Oscar became fast friends with Eliza, because he was nearly her age; but because he was so small and had trouble walking, she carried him everywhere. He turned eight the day before we left Mexico. We didn’t know it at the time, but that would be Oscar’s last birthday. He died just last week. We pray he is running and jumping and riding his big wheel in heaven in his new body now. And we are thankful we got to meet him here. This year, we’re going back to build another home. Our family needs to raise a total of about $2000 for the trip. We had just finished helping someone else with fundraising for another project when we realized we were behind schedule with this one. With your help, we can still reach our goal on time! Thank you for contributing to the cost of our mission trip. We are grateful to you. Checks can be made payable to Shannon Oaks Church with “Turner Girls’ Mission Trip” in the memo line. Contributions made payable to Shannon Oaks Church are tax deductible. Funds received above total individual expenses will be applied to the fundraising total for the team, and funds in excess of the team/trip total will be applied to Global Missions at Shannon Oaks Church. August had been miserable in Columbia, Maryland. Hot and humid are even more difficult to deal with when you’re dirt poor and living in a 1,000 square foot apartment. September wasn’t much better. Indian summer stretched through the month, and our electric bill (from running the a/c) went through the roof. My wife was a trooper through her first pregnancy. Didn’t complain much until right at the end. Then she decided, “I’ve made it this far. From now on I’m getting what I want.” It was 90 degrees outside and about 60 in our apartment. There could have been a thunderstorm in our doorway! Making the month especially…interesting: my mother had come out for the birth of her first grandchild. She was helping…sort of. My father juggled his schedule so he could fly out the day after Jill’s due date. He spent an entire week twiddling his thumbs, reading all my books and jumping every time Jill sneezed. Eventually, she started hiding in the back bedroom. She just got tired of being stared at. Then he left disappointed — no baby. So, after our Tuesday night Bible study we watched Emeril, packed our bags, waved goodbye to my mother, stopped at the grocery store for snacks and headed to the hospital. On the way there, Jill had indigestion or Braxton-Hicks contractions or something. The funny thing is, they were 14 minutes apart. It wasn’t until we were sitting in the waiting room filling out forms that I realized she was in labor. There would be no sleep that night — or the next. Every day was filled with hope and expectation and disappointment and more hope. We knew it wouldn’t be long, and even though it was longer than we expected, we never lost hope. Not even after hours and hours of more nothing as we sat in the hospital waiting…and waiting…and waiting. She ran out of water in there. Lingered and swam and rolled over until there was nothing left in there but her. And she still wouldn’t come out.The doctor told us it would be soon. They lied. Jill struggled and suffered and waited too long for the really good pain stuff. I tried my best to keep her distracted, playing Yo-Yo Ma cello music softly in the background, reminding Jill to breathe and cracking inappropriate jokes at appropriate times. Then, after what seemed like an eternity, everyone got in a big hurry. Her heartbeat was growing faint. The doctor looked scared, and I readied myself for the possibility that I might not get to see her after all. I was asked to sign some forms. The doctors were trying to explain to me how any surgery is dangerous, and you never know what’s going to happen and they’ve done this a million times but there’s always a chance…. That’s when it dawned on me. Through the sleepless fog came the idea: I arrived at this hospital expecting to leave with one new member of my family; I might actually leave with one fewer. Suddenly we were whisked upstairs into an operating room. I had scrubs on, and they were cutting Jill wide open — going in after our little girl who will forever be remembered by the scar she made on her way out. She still prefers to do things in her own sweet time. I’ve seen parts of Jill she hasn’t seen. It all seems like a far away memory of a dream now. Everything was slow and fast all at the same time. We had no idea what we were in for. You blink, and she’s seven. Going to school. Riding her bike. Having a slumber party. And you know: we’re more than halfway to being a teenager now. It still goes slow and fast at the same time. And I find myself begging God to slow down time so I can catch up. But it’s no use. Time moves at its own steady and relentless pace. And we stride towards the inevitable day when we will launch Anabel out into the wide world. There’s a part of me that gets excited about that idea. There’s another part of me that’s just glad that for today she’s still only seven. Two weeks and 3,350 miles after it began, The Turner's Great American Roadtrip ended as we pulled into my parents' driveway in McDonough, GA. It has been said that we ate our way across this great country of ours. It has even been suggested that should I ever stop being a pastor, I could conduct travel tours of the great dining establishments found along the southern portion of the US. From the outrageously good burger at Joe's Farm Grill just outside of Phoenix to the stuffed sopapilla in Flagstaff to the green chile stew at the Blue Corn Cafe in Santa Fe to the steaks at the Big Texan in Amarillo to the cheese enchiladas and margaritas at Joe T. Garcia's in Fort Worth to the crawfish etouffee and alligator bites at the Cyprus Inn in Monroe to the Eggs Shannon and Bananas Foster at Brennan's in New Orleans to the crab cakes at Crab's in Pensacola -- it was quite a culinary adventure. And along the way -- this is the best part -- there were people who we love. Old friends and new friends who were extraordinarily hospitable and overwhelmingly generous. The Leeses bought us dinner at Disneyland. Jill's family went with us to Joe's Farm Grill, where we all ordered up and split our entrees with one another. The Powells opened their home to us, grilling steaks and inviting the Stowers and Deloaches over -- even asking me to preach for their church. The Hughes family cooked southern fried chicken and green beans for us and let our kids run off some of the energy they'd accumulated. Christopher Green met us at the Dallas Farmers Market and bought us good, cheap Mexican grub. John and Maggie Dobbs (and the amazing wiener dog, Jackson -- aka "Oscar Gorge") took to our girls like few people have and allowed me to teach a Wednesday night class in the building where I went to elementary school. Denny and Philis Boultinghouse along with Johnny Howard and Leonard Allen treated us to lunch at Copeland's as we talked about the rapidly-changing landscape of the publishing industry -- especially as it has to do with my next book for Howard Publishing. Rick Hazelip and the folks at First City Church in Pensacola asked me to preach for them and allowed us to stay in a condo on the beach for next to nothing. Jill and I constantly found ourselves wondering, gazing out the minivan windows as the terrain shifted from the rocky pacific coast of California to the painted deserts of Arizona to the badlands of New Mexico to the high plains of the Texas panhandle to the hill country of central Texas to the bayous of Louisiana to the white sandy beaches of the Gulf Coast -- each beautiful in its own unique way -- how in the world we've managed to collect so many wonderful friends in so many wonderful places. All we can think of is God has been preparing us for a trip like this for a very long time. Knowing how vulnerable to disappointment and bitterness we would be at such a time as this, he made certain we could find the encouragement we so desperately needed. Two weeks later, we find ourselves back in Atlanta, strangely less weary than when we'd first begun and greatly cheered by our travels, our hearts full to overflowing with gratitude for all those who helped, eager to discover what God has in store for us next. It took us forever to get out of Atlanta. We slept too late. I had to go get new glasses (long story). We still have a million little odds and ends to get packed. And we had to take our cable modem back to the cable office -- which is impossible to find. So, on the first day of our road trip, we barely made it to Tuscaloosa. Not the prettiest place in the southeast. The girls were fussy. Coco the dog needed tranquilizers or something -- he was freaked out. Jill and I were snippy at each other. We were not off to a good start. The second day started the way the first day left off. We were all groggy and fussy and in a pretty bad mood. Coco eventually settled down, but the girls were engaged in the classic struggle over the middle of the backseat. That seems to be one of those things you don't have to teach kids to do; fighting over where to draw the invisible line that separates "your area" from "my area" must be part of our sin nature. We took away every privilege we could think of, and, when that didn't work, we may or may not have threated to leave one of them at a gas station in Meridian, Mississippi. Not our finest hour as parents! But we got to Jackson and stopped at a Cracker Barrel for lunch. After having a "little chat" with our darling children, I stumbled upon the single most important discovery of our trip thus far: Cracker Barrel lets you rent books on CD -- children's books -- unabridged children's books. For the next five-and-a-half hours we rode in blissful, fight-free silence listening to Eden Riegel read Ella Enchanted. Not only is this a fantastic children's story (with an even better message for those parents who want nothing more than to "make their children be obedient"), but it allowed us to make great progress. We stopped only so I could attend a conference call with my agent, my co-author and some of the folks marketing The 52 Greatest Stories of the Bible. By the way, things are really starting to gear up on that front, and you'll be hearing more about that in the next few days. By nightfall, we had made it to Tyler, Texas -- right at 500 miles and three state lines. We crossed the Mighty Mississippi and rolled through the Sportsman's Paradise into the Great State of Texas. We'd seen more trees and variations of the color green than we ever thought possible. We ate good Tex-Mex and swam in the pool. It was a full day. Day Three got a leisurely start. I wanted to get to Dallas by lunch to meet up with my good pal Tim Spivey. Tim's all set to be the next Sr. Minister at North County Church of Christ in Escondido, CA. The movers were at his house the day we had lunch at a terrible all you can eat pizza place in not-so-beautiful Balch Springs, TX. We ate and chatted, and my girls were still on their pretty good behavior. Then we put our head down and drove all the way to Midland, TX. The trees pretty much stop after Fort Worth, and the landscape flattens out considerably. Then you hit the Hill Country, but things go from that deep green of the south to a more khaki green and tan. After seeing so many cows that day (my kids especially liked the look of longhorns), we thought steak must be on the menu. The Cheetah Girls movie was on, so that kept us out of the pool, but it was mercifully short. All of my girls fell asleep watching Olympic Volleyball. Day Four was our longest day. Jill really wanted lunch in El Paso, so we hit the road and kept going until we got there. It was a late lunch, but boy-o-boy was it good! The speed limit is 80 most of the way, so we really started piling up the miles, and we crossed two time zones which helped. That gave us a 26-hour day to work with. We saw the hilll country flatten out completely. Then we saw our first cactus. Then we saw the red clay give way to sand and dust. Surprisingly, we got slammed with rain for about 15 minutes, and the temperature dropped to 67 degrees in New Mexico. We listened to Stockard Channing read Ramona and Her Mother by Beverly Cleary. For those of you who may not remember, Ramona was the Junie B. Jones of the late-70s and early 80s. The girls really liked it. I'm not sure what exactly got into us, but we drove all the way to Tucson. We got there late, and we were all tired and hungry and griping. Our hotel was not very nice. Our dinner was even worse. But the beautiful thing was knowing that the next day would be a short one. We have family in Phoenix. So, we got up and drove a couple of hours. We checked into our hotel early. We ate In-N-Out Burgers. We swam in the pool. We played with cousins and an aunt and uncle and a grandma. We liked it so much we decided to stay here an extra day. By the way, do people live in Phoenix on purpose? I just can't imagine it. It was 107 degrees yesterday. Last night, as we left our dinner party and headed back to our hotel, it had cooled down...to 95. It was 95 degrees last night at 10:30! It's not like this was surprising. It's not like this is some kind of fluke. This isn't a one-time anomaly. It's this hot all the time. And people live in that kind of weather intentionally. Not only that, but they talk about it like it's the greatest thing ever. "Can you believe how hot it is?" "Yeah, isn't it great? But it's a dry heat!" "So is a brick oven!" Seriously, I'm pretty sure the surface of the sun isn't very damp. But no one wants to live there. I find myself constantly wondering about the interior temperature of the van and whether there may be something in there with a flash point of, say, around 300 degrees -- which is probably how hot it is in there. I'm afraid to touch any flat surface outside because I'm sure my skin will actually stick to it. Tomorrow we'll head to the Grand Canyon and maybe Lake Havasu -- which I hear actually gets about five or six degrees warmer than Phoenix. Really?! It gets warmer than Phoenix? What I really want to know now is how there is still water in Lake Havasu if it's that hot? Why hasn't it all evaporated? Greetings from Phoenix, everyone! Land of hot. Land of sun and sand and cactus and family and In-N-Out burgers. I can remember, when I was a kid, my grandparents lived in Atlanta, and I lived in West Monroe, Louisiana. Coming to Atlanta was like coming into the City of Oz -- giant buildings glimmering in the sunlight. We had to drive past Six Flags to get there, and that only added to the fun and anticipation of what might lie ahead. We'd see that golden dome of the Capital Building. We'd eat at The Varsity. It was so not West Monroe. And I loved it here. Of course, we were always coming to visit around holiday seasons, so that sense of wonder was always hanging in the air. Thanksgiving. Christmas. Fourth of July. There would be food and fireworks. Georgia football. Or Braves games. Man, I remember going out to the old Fulton County Stadium and sitting in the bleacher seats to cheer on a team that was just terrible. But I didn't care. It was part of being a little boy in a big city. And I dreamed of one day living here. Then when I was in fourth grade we moved to California -- the opposite side of the world. I remember going to Dodger games when the Braves were in town. I felt like that guy in the old School House Rock cartoon: "Hooray! I'm for the other team!" Oddly enough, my family eventually moved to Atlanta -- Stone Mountain to be precise. We moved at the beginning of summer in between my freshman and sophomore years in high school. And I hated it here. It rained all the time -- seems odd to say that given the past few years of drought, but the summer of 1985 was wet here in the south. I'd absorbed enough west coast snobbery to really live with a chip on my shoulder out here. I wasn't very pleasant to be around, and I let people know at every opportunity that I was only here because my parents wanted to move here. The first chance I got (high school graduation), I drove straight to the Pacific Ocean and lived there -- Malibu to be precise. But life is funny sometimes. I married a woman who wanted to work at the Olympics more than anything else she could think of. So, in 1994 we moved right back here to Atlanta. We've left a couple of times in the 14 years since then, but we always seem drawn back here -- the last time was nearly six years ago. Maybe it's the charm of the new south. Maybe it's the climate. Maybe the affordable housing. Maybe the Braves. We have more friends here than I could name. Dane & Christy. Steven & Angelique. David & Pam. Michael & Dawn. Danny & Tammy. Bob & Jenn. Chuck & Laura. Hal & Jenny. Phil & Holly. Yuriy & Nadia. Jeff & Elizabeth. Ken. Mark. Greg. Leigha. We've been to weddings and baby showers and funerals. Late night hospital trips. Emergency rooms. After church lunches. Small group dinners. Cookouts. Movies. Concerts. Midnight phone calls. Back porch conversations about marriage and kids and dreams and fears and hurts and love. A couple of years ago I said that God himself would have to show up and pry us out of Atlanta. Who knew he'd actually take us up on that offer? That is precisely what we feel has happened. God is calling us to this new venture back in southern California. Being the type of people who long ago determined to respond to such promptings, we are eager to obey. But we are so, so incredibly sad to go. I cannot remember feeling such a complex swirl of emotions as I feel tonight. In a matter of hours, I'll say goodbye to this beautiful city where so much of who I am was forged. Where so much of what I know was learned. Where so much of my heart will stay. Sometime tomorrow -- perhaps as you are reading this -- I'll drive past the golden buildings shimmering in the summer sun. I'll drive out past Six Flags, and I'll look back at Atlanta in the rearview mirror. And I will miss it here so much. Farewell, Atlanta. And farewell all you fair Atlantans who have meant so much to us over the years. We love you more than we can say. And we will most likely be back sometime. It's hot and dry and dusty there in the summertime. It feels like someone's following you around with a hair dryer blowing in your face all the time. The nearest Italian restaurant was more than an hour away from our house -- if you don't count Pizza Hut -- which you shouldn't. It's also flat. My standard joke is that Amarillo is so flat that on a clear day you can see the back of your own head. The golf course I played there was called "Hidden Hills". And if by "hidden" one means "non-existent" then it was an aptly-named course. There are some nice people. We made some friends there. There are also some of the meanest people I ever encountered. We got hate mail from church people. It was the hardest time of our lives. It was some of the most profitable in terms of lessons learned. It almost made me leave church altogether. But it drove me closer to God than I ever was before. And it solidified my marriage like nothing else ever has. But, without a single doubt, the best thing about Amarillo, Texas is that seven years ago this morning we were given the gift from God that is Eliza Faith Turner. According to Vision 360's California office, Ventura and Santa Barbara Counties (which are just to the northwest of Los Angeles) are home to approximately 1.2 million people. Roughly 14% of those people attend a Christian church of any kind on any given weekend (7% Catholic, 6% Evangelical, 1% Mainline Protestant). In the past decade, that number has decreased by 2.5%. Think of it: More than a million unchurched people in those two counties alone. Nearly 500,000 of those people live in the Ventura/Oxnard Metropolitan area. This area currently has 130 Evangelical churches. By way of comparison, Davidson County (Nashville, TN) has a population of just over 600,000. There are more than 750 churches there. Forsyth County (where I currently live) has a population of right around 150,000. There are 37 Baptist churches here. Statistically speaking, the best way to reach unchurched people is through new church plants. On average, a church that is older than 10 years can expect one new convert per year for every 89 members. A church that is between 3 and 7 years old averages one new convert for every 7 members. A church that is under 3 years old averages one new convert for every 3 members. It is for these reasons (and several others) that I will be flying to California this weekend where I will announce the plan for my family to move to Ventura County this summer and join the launch team of River Park Community Church. We are excited. We are nervous. We are terrified. We have no idea how we will survive financially. This makes very little sense...unless there really is a God who is bigger than all of our obstacles and fears. Now, more than ever, my family needs your prayers, your friendship and your financial support. Please, prayerfully consider giving money to support this new work in such a vitally important region of our world. After a long and very emotionally draining week, my wife and I have returned home. We're glad to see the girls, glad to see the dog, glad to sleep in our own bed. Thanks to all of you who provided support through your prayers, condolences and other help. We're hoping to get back to something like normal next week. This morning, just after 10:00am Pacific Time, Jillâ€™s father â€” Harold Dean Foley â€” passed away. As many of you know, Jill has spent a lot of time in California tending to him over the past 18 months. We are glad she had the opportunity to have a couple of weeks with him recently, when he was lucid and communicative. We are also glad that we were able to fly here yesterday. She was with him, at his bedside, this morning when he died. Thank all of you who have made it possible for her to spend so much time dealing with this. You have watched our children, walked our dog, driven us to and from the airport, assisted us financially, emotionally and spiritually. We are truly blessed to have such a wonderful support network as you. At this point in time, weâ€™re unsure of what the next few days will hold. He did not want any sort of memorial service. We will be out here until his affairs have been settled. "I have a dream today. I have a dream that one day every valley shall be exalted, every hill and mountain shall be made low, the rough places will be made plain, and the crooked places will be made straight, and the glory of the Lord shall be revealed, and all flesh shall see it together. This is our hope. This is the faith with which I return to the South. With this faith we will be able to hew out of the mountain of despair a stone of hope." There is power in a dream, especially when that dream is in sync with God's dream. God longs for justice and redemption, and tells us that one day all the things that are wrong about our world will be set right. Dr. King's dream was powerful enough to lead people to sit in, stand up, march on, take notice and suffer abuse for the sake of preventing further abuse. He inspired leaders, recruited followers and demanded legislative reform. This preacher man on a plumber's salary moved people, black and white, because he could envision what was true, good and beautiful, and he refused to give up. He said that justice would one day roll down like waters, and righteousness like a mighty stream. By his absolute refusal to be silenced, he forced America to deal with the error, the evil and the ugliness of racism. Martin Luther King, Jr. was a hope-filled and inspirational leader. He was also a dad. While he was in Washington, proclaiming his dream that his children would "one day live in a nation where they [would] not be judged by the color of their skin but by the content of their character," his wife Coretta was caring for his four children, the youngest of whom turned five months old that day. King left a legacy of hope...for our nation and for his own family. What kind of legacy would you like to leave for your family? What are you willing to do to ensure that legacy? It was four years ago today. I remember where I was standing when Jill first told me about her. It was a Sunday morning, and we were at North Point Community Church. I was watching a baby crawl across the floor, and Jill asked, "Are you ready to have another one of those?" My first response was to laugh. Eliza wasn't even out of diapers yet. We'd just come through a great scare with her, and I was questioning our ability to handle two little girls. The idea of having a third was...well...laughable. Fortunately, I did not laugh. In fact, Jill says it's one of the only times she's ever seen me speechless. It took a full 10 count before it occurred to me what exactly she was trying to communicate to me. I'm not normally that slow on the uptake. But this was so far beyond anything I was thinking about. We were poor. I'd quit a job to pursue something. It was slow to develop. I had the rug yanked out from under me. I was confused and frustrated, hurt and angry. If it hadn't been for Ken Boa we never would have survived. We chose the name Amelia. It means "industrious". Amelia Hope. We work with a sense of great expectation. She's been work, that's for sure. But we have a strong belief that God has big plans for this little one. She showed up a little early -- while Jill's regular doctor was away on vacation. We had to use a different hospital from the one we'd toured. We had to use a different doctor from the one we'd come to know and trust. I was supposed to spend the weekend writing a script for KidStuf. I had to call my friend Bill Winegardner and hand it off to him. He wrote a classic, by the way. We called some friends, and we called my parents. I think Steven and Angelique Allen took the two big girls. It all happened quickly. It's kind of a blur. Chuck and Laura Thon showed up right after she got there. Hal and Jenny Runkel came the next day. So did Dane and Christy Booth. She didn't make a big deal out of her arrival. Unlike her sisters, there was little struggle. She's always been her own person and does things in her own way. She's full of surprises. She makes me laugh, and I find myself doing anything I can think of to return the favor. It's hard to believe she's four. And I cannot wait to see how this turns out. A few hours ago my family returned from California. Jill and the girls have been out there for five weeks. I was out there for two, which is long enough to adjust to the time change. It's nearly three in the morning, but my body thinks it's just now midnight. 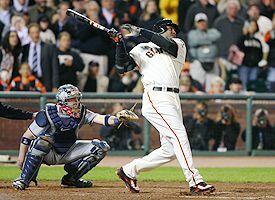 We got home just as the San Francisco Giants' game against the Washington Nationals was starting, so I was watching intently as Barry Bonds strode to the plate and hit a double to the gap in his first trip to the plate. I was also watching when he came up again and lined a solid single. I was really glad to see the Nats actually pitch to him. I was laying down with my three-year-old daughter when he came to the plate a third time. She'd wanted her mother to read her a story, but Jill was busy so I stepped in as a not-entirely-welcome second-stringer. It took some convincing, but Amelia eventually decided that she'd settle for me -- since I was the only parent available. We talked for just a couple of minutes, and I could tell she was getting drowsy. By this time Barry was in the on-deck circle, but she was so close to falling asleep that I didn't want to move for fear of waking her up. Her breathing was just starting to go deep, and she was so tired. I could barely hear what was going on from the television downstairs. It got kind of quiet. Then it got really loud, and I knew what had happened. Jill said, "John, come quick!" I remember a warm spring afternoon in 1981 when I got to see the debut of a chubby Mexican teenage phenom pitcher named Fernando Valenzuela. I remember where I was (Pepperdine Dorms) when I saw Kurt Gibson hit the homerun in the World Series in '88. I remember where I was (Dunwoody, GA) and who I was with (Rick Hazelip) when Dave Justice redeemed himself by hitting a solo shot against the Cleveland Indians in '95. I watched live on ESPN as Cal took his victory lap around Camden Yard. I remember watching Big Mac hit number 62 from a sports bar in Staunton, Virginia. I've seen my share of memorable baseball moments -- some of them in person, most of them live on television. But I had to settle for instant replay this time. And I'm okay with that. Performance-enhancing drugs are part of the game. Let's be grownups about that. To some extent, they always have been. Roger Maris and Mickey Mantle were getting more than vitamins in those injections! More than half of the guys who've been busted for using steroids have been pitchers. I'm not saying it's right, and I'm not saying Barry's clean. I don't know anything about him for sure (except his noggin has gotten huge, and that ain't normal), but I do know that if a hitter's using, odds are the pitcher is, too. So, the field is pretty level as far as I can tell. And 756 is a lot of homeruns. I've never hit one in a Major League ballpark filled with tens of thousands of cheering fans. I don't know what it feels like to round those bases and have Hank Aaron congratulate you on the Jumbo-tron. But it can't be much better than having your youngest daughter fall asleep on you. That's me. I'm a bachelor these days. I put Jill and the girls on a plane for California Tuesday afternoon, and I've spent the remainder of my week eating pizza and red meat, watching sports at full volume (Wimbledon is on right now) and sleeping in. The other night I watched Casino Royale -- the latest James Bond movie -- and I didn't even start it until after midnight! Oh, I also went to see the new Fantastic Four movie yesterday. I'm planning on going to see several movies where lots of things get blown up. My friend Ken Boa said to me yesterday (in the tone of voice that only Ken can produce and maintain), "I see you descend into degeneracy when your family is gone!" It's true. I live like a caveman when my family's not around. I don't shave. I don't have many conversations. I don't tend to seek out the company of other people. I have to force myself to go out of the house. I'm grateful for the friends I have -- new friends like the Locke family who invited me to their cookout on the 4th -- old friends like the Blackwells who had me over to watch fireworks or Steven who went with me to the movie yesterday afternoon or Dane who came over and ate 'brats with me right after the girls left. I'm thankful that God has blessed me with really great friendships. But no one takes the edge off me like my wife and kids. My challenge this weekend is to maintain whatever civility I gained from them, to live less like the Neanderthal I tend towards and more like the refined and domesticated variety I am when they're around. Pray for me. Pray for the house. Pray for the dog. Pray for Jill and the girls and whatever they might find when they next see me. I had dental surgery on Thursday afternoon, and it hurt. I've got a gaping hole in my mouth where my tooth used to be, and the worst part is one of the four stitches came out and started floating around in my mouth while I was speaking to a group of singles at their Memorial Day Weekend retreat on Saturday night. Good times. Actually, it has been good times here this weekend. I'm in Panama City Beach, FL. The North Atlanta Singles' Retreat was this weekend, and I was honored to be invited to speak to about 65 young adults about their expectations and how our expectations sometimes set us up for all kinds of disappointment. We talked about our expectations of God and learned from the apostle Paul how to stop expecting God to improve our circumstances and start expecting God to show up in surprising ways in the midst of difficulties. Then we talked about our often unreasonable expectations of ourselves. We learned from Nebuchadnezzar how crazy we make ourselves when we forget that we're not God and try to live with just our own strength. Then we talked about our expectations of others, and we learned from Solomon that the thing that often makes our relationships so disappointing is that what people really long for is unfailing love. People just can't offer that -- no matter how hard they try. Finally, we talked about how Jesus taught people to pray -- specifically how he taught his earliest followers to close their prayers: "Yours is the kingdom, and the power, and the glory forever". If God's is the kingdom, then our response is to surrender. If God's is the power, then our response is to ask. If God's is the glory, then our response is to worship. It was really a good time -- hopefully, it was a time folks will remember for a while. I was surprised by God once again, because I was pretty unprepared for this weekend -- what with my face going through so much trauma and all. I came down here with something of an idea for what I would say in the first two sessions, but not much beyond that. Still, God showed up and surprised me. The vicodin helped a lot, too. Hopefully, others were helped too -- by the messages -- not by the vicodin -- I'm not sharing my drugs with anyone. If you'd like copies of the cds of the sessions, leave me a comment here, and I'll see that you get them. If you were praying for me, I appreciate that more than I can say. The best part of the weekend, however, is the time I've gotten to spend with my wife and daughters. We played on the beach and made sand castles and went out to dinner and shook hands with a dolphin. We watched some college students do a high-dive act. We played and walked and talked and had a really wonderful time. And the folks at the retreat loved on my kids so much! They treated them with respect and sat in the middle of the floor with them, had conversations with them, swam with them. I love watching other adults treat my daughters well. All in all, it's been a very memorable Memorial Day Weekend for us. My family spent all of last week in California -- southern California to be specific -- Orange County and Malibu to be even more specific. We flew out Monday afternoon and spent the night with Jill's best friend from high school. Tuesday was our all-day Disneyland marathon. Wednesday I drove up to Pepperdine University early in the morning and got us checked in. Jill and the girls stayed behind to have lunch with her father. We spent the rest of the week on campus -- where we were honored to teach two classes based on the material in Hearts and Minds: Raising Your Child with a Christian View of the World. My body is thoroughly 37 now. I used to be in such great shape, but the campus of Pepperdine will let a person know just how well they've done in the "keeping up with cardio" area of fitness. I didn't fail, but I didn't exactly pass with flying colors. The most distracting sound in the world (for me at least) is the sound of an aluminum bat striking a baseball. I got checked in on Wednesday morning and went to my dorm room for some writing. I figured it would be perfect because Jill and the girls wouldn't be there, and I really wanted to push ahead on this book. But as soon as I got situated at my desk overlooking the Pacific Ocean, all I could hear was the sound of Pepperdine's baseball team taking batting practice. I was unprepared for all the nostalgia that awakened in me! And I could not concentrate on writing at all. I can focus with the girls climbing all over me, the dog barking, the phone ringing and loud music playing in the background. But that "clink" every 30 seconds or so did me in. I do not understand the culture of lectureships, workshops, camp meetings, etc. I counted 21 different offerings available for the 8:30am slot alone! There was not consistent theme to most of what was offered. It seemed to be a bunch of preachers bringing their best three-part sermon series. And you could probably attend five or six different lectures every day. That's frustrating to me. As a speaker I want to call people to do something, but there's no way to do that in this format because the next speaker's going to do the same thing. An attender can't possibly process all that information and will probably forget most if not all of what was said as soon as they leave. I guess the whole purpose is to pump people up -- some kind of pep rally -- send them home with a buzz. But that's a self-defeating thing, isn't it? I'm clearly too something -- too utilitarian, too boomer, too emergent, too evangelical, too something to get what the purpose is other than to say, "Man, that was great. I can't wait until next year to do it again." There seems to be something wrong with saying that you "enjoyed" a lectureship whose theme was drawn from Jeremiah -- a prophet who called a stubborn and stiff-necked people to repentance with tears and performance art. I just have such a hard time imagining Jeremiah writing his words down, thinking about the future of God's people, pleading with them to stop acting like whores and return to the only One who has ever really loved them -- I cannot imagine him writing through his tears of frustration and anger and thinking, "Maybe one day people will gather in a luxurious setting to sift through this material and tell each other some great preacher jokes -- yeah...that'll be a good time." Malibu is among the most beautiful places on earth. If you can't teach natural theology in that setting, you should look for other work. And yet the irony is that so few of the people who live in that setting (many celebrities) spend so little time contemplating the source of all that beauty. Clearly, Christians aren't doing a very good job of explaining things. You'd think that people who live surrounded by that kind of beauty would be the easiest people in the world to connect with the God of beauty and creativity. But there's some serious disconnect going on there. There's a lot about California that I miss, but I'm glad I live in Atlanta. I miss so much about the southern California culture. I miss the beach -- specifically I miss staring at the Pacific Ocean, especially the sunsets. I miss the breeze. I miss good Mexican food. I miss the vibe of the place -- the look and smell of it. But I love where I live, too. I love having a big yard and a decent-sized house. I love the trees and the green and the flowers and the southern culture. I have some nostalgia for SoCal -- but Atlanta feels like home now. The magic of Disneyland still works. It was absolutely amazing to watch my little girls discover Disneyland -- in all of its glory and wonder. The old rides that I take for granted (Mr. Toad's Wild Ride, The Jungle Cruise, The Tea Cups, Dumbo, It's a Small World) were the biggest hits of all. Seeing the looks on my daughters' faces, watching their eyes light up as they were caught by surprise by all the same gags that I've known for nearly three decades now -- that was so worth the price of admission. I am not who I once was, and I like who I am becoming. God has taken me on an amazing journey over these 37 years. I've experienced so much for which I am grateful. I have done things that embarrass me to think about. I have done things I'm proud of. But I am constantly changing, emerging, evolving, striving for what is ahead while trying to honor what is in the past. Sometimes I'm better at doing one than the other. It's difficult to actively reach forward without it feeling like you're rejecting what's behind, but that's what I'm attempting. I like who I am now much better than the person I was nearly 19 years ago when I was a freshman at Pepperdine University. And I can't wait to find out what God's up to next, how he'll continue to shape me as I move into the next season of life and who I'll become as a result of his guiding hand. I'll probably be out of the loop for the rest of the week. I'm heading to the airport to get on a plane to California, and this time I'm taking the whole family! We'll hit Disneyland tomorrow and spend the rest of the week at the Pepperdine Bible Lectures. Jill and I will teach a class on Thursday and Friday morning. Then we'll fly home Saturday so I can preach again at The Bridge on Sunday. I'm not sure if I'll have internet access, so this may be the last post for the week. I should probably give you something good to discuss. I'm speaking Sunday morning about stem-cell research and cloning. So, let's see what you have to say about those two hot-button issues. Should Christians oppose stem-cell research? Why or why not? Would you ever be in favor of human cloning? Why or why not? I've had a great time this weekend. What a fantastic group of folks. I know they don't have sushi or trees or a decent airport, but the people here are some of the finest people anywhere. I'm headed to Pampa to watch the Super Bowl in a few minutes, and I hope you're watching the game (and the commercials) with good friends. The Super Bowl should be about food that's bad for you and people who are good for you. I have a prayer request: My wife and I are going to California next week. We'll be speaking to some married couples about how they can safeguard their marriages. Great marriages don't just happen, you know. Like anything worthwhile, they require thought, intentionality and some work. As we've been preparing for this, we've seen a couple of marriages around us really struggle -- one in particular seems to have come apart at the seams. I've also noticed little ways that our own marriage has come under attack. I'm not one of those guys who believes there's a demon behind every bush, but I believe our enemy would like nothing better than to get in between me and Jill as we prepare to talk with those husbands and wives. Would you please pray for us this week? Pray for our marriage? Pray for the folks in California? Pray for our girls as we travel to the other side of the continent? One thing before I close: I think the panhandle of Texas has the best sunsets in America -- well -- second to Malibu, CA. I'm heading to the airport in a few minutes -- doing a parenting seminar this weekend in Cleveland, OH. I haven't traveled since the second weekend in December! It's been great sitting around the house, but I'm ready to get back to work! And, boy, am I going to hit the ground running. I'm in Cleveland this weekend. Then I go to Amarillo, TX. Then I go to Santa Rosa, CA. I have President's Day Weekend off. Then, I speak at a church here in the Atlanta area two Sundays in a row. Then back out to California. I'm going to Milwaukee (land of beer and cheese) and Hanover, PA (land of potato chips). I sure would appreciate your prayers for me and my family. I think we're all a little out of practice with my travel schedule having been dormant for nearly seven weeks. Pray for my wife, especially, if you would. She gets to stay home with the girls after what's been a really emotionally draining week. I'm a little anxious about this weekend. I'm presenting some new material in this seminar, and that always wigs me out a little. Oh, and it's supposed to snow the entire time I'm there. Okay...without further interruption...your Friday Sports Question is: Who will win the Super Bowl? Who is going to win: Colts or Bears? There is power in a dream, especially when that dream synchs up with God's dream. God longs for justice and redemption. He tells us that one day all the things that are wrong about our world will be set right again. Dr. King's dream was powerful enough to lead people to sit in, stand up, march on, take notice, and suffer abuse for the sake of preventing further abuse. He inspired leaders, recruited followers, and demanded legistlative reform. This preacher man on a plumber's salary moved people -- black and white -- because he knew what was true, good, and beautiful, and he refused to give up. He said that justice would one day roll down like waters, and righteousness like a mighty stream. By his absolute refusal to be silenced, he forced America to deal with the error, the evil, and the ugliness of racism. Martin Luther King, Jr. was a hope-filled and inspirational leader. What we often forget is that he was also a dad. While he was in Washington, proclaiming his dream that children would "one day live in a nation where they [would] not be judged by the color of their skin but by the content of their character," his wife Coretta was caring for their four children, the youngest of whom turned five months old that day. King left a legacy of hope for our nation and for his own family. He was a man willing to die for his convictions. Oftentimes, I can barely be troubled to throw a little money towards mine. What do you suppose his children learned by watching the actions of their father? What do you suppose your kids are learning by observing yours? Jesus taught hard things. He once told a man to sell everything he owned in order to be a disciple. He said that the way up is down, and the greatest person in the kingdom of God would be the one who serves the most. He came up with the whole "turn the other cheek" thing and then showed us how it's done. He talked about all the things you're not supposed to talk about: hell, money, divorce, taxes. He challenged people in positions of authority and disrupted the status quo with his message and his lifestyle. Like Philip Yancey says, "He wasn't Mr. Rogers with a beard." But before he did any of that, before any of the teaching or any of the ethical mandates, he did something remarkable. He built a bridge. Before he gave us truth, he gave us grace. Jesus lived before he was born. That's kind of hard to imagine, but it's true. He has lived for all of eternity and was there when everything that has been made was made. In fact, the Bible says that he was the One who created it all. It was all made for him and by him, and he is the One who holds it all together (Colossians 1:17). Yet, for a short span of time, he actually entered into the world he fashioned and lived in it. Like an artist climbing inside his own painting, Jesus entered our world's time-space continuum and was -- to some mysterious extent -- subject to its laws and limitations. He got hungry and tired and had to go to the bathroom. In fact, when he was born, he was not pretending to be a baby; he was a baby. The Incarnation was, among other things, scandalous. Jesus' humanity -- his ordinariness -- is what got him into trouble with the religious leaders of his time. He didn't act like they thought the Messiah should. He acted more like a real human. We'll talk more about this in another post, but for now I want us to think about this: If Jesus was willing to go to such ridiculous lengths in order to identify with us and build a bridge of relationship with people who were estranged from him, can't we all just try a little harder to get along with family -- even extended family -- this Christmas?